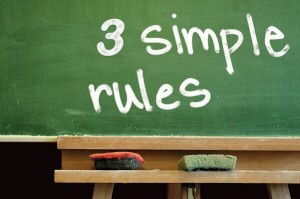 3 simple rules for anyone who is YOUNG, DETERMINED and WANTS MORE THAN ANYTHING TO SUCCEED. 1. Be responsible - The younger you claim responsibility for your life and aim to make it a success, the faster you will begin to see the results. If you are in your 30s, still prancing around your parents and acting like a teenager, living in your daddy's home....to put it finely....another 30 years given to you wont make a difference. You will never make it as Long as you continue to be your worse handicap. All winners start young. Men who made it in their 40s started on the journey to success in their teens. 2. Be wise with money - You can be unwise in anything but none will hurt you more than money will if you treat it unkindly. Spend wisely and simply end every month with a profit to tuck aside for savings and investment and you will see your nest egg grow. Say for instance you have $100,000 in cash today.....I know for a fact it took years to amass. Money don't just spring up in your drawers. Wisdom will pay you dividends for decades. Foolishness in spending will make you pay for your debts for a lifetime. 3. Invest in others - If you don't know how to run a business, why risk and lose that $100,000 you saved by going into a venture that's unknown to you. There are many successful business on the market and on the stock exchange, find one that you understand like DBS or Keppel Corp and invest in in by buying their shares. A share is a freehold title to a business. It's very likely a company like SingTel is going to be around Long after we are all dead....so use the $100k and invest in a successful business. A more advanced technique is value investment where you learn to valuate a business and buy it only when it's cheap is called VALUE INVESTING. Learn from the best. Warren Buffett is my favourite billionaire.